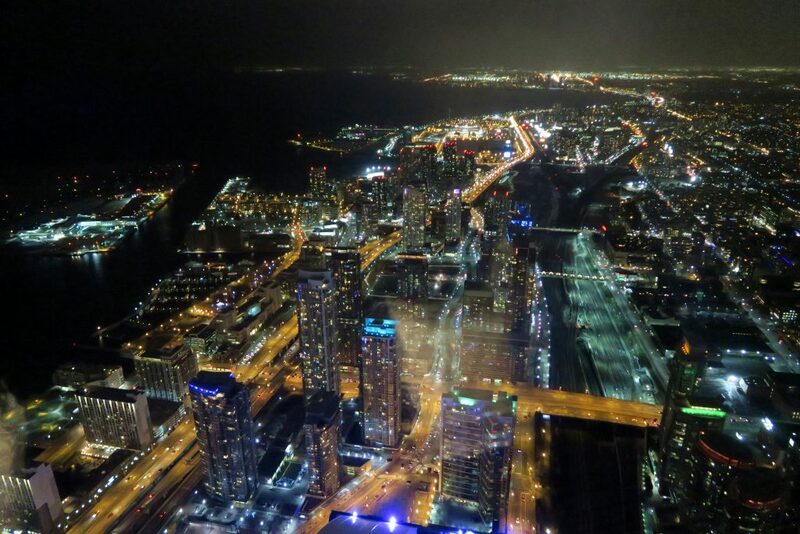 Toronto was my family’s destination of choice between Christmas and New Year for 2016. Every year, we try and go away during that period and while looking at destinations for this year’s trip and realised I hadn’t properly written about our last Christmas trip! 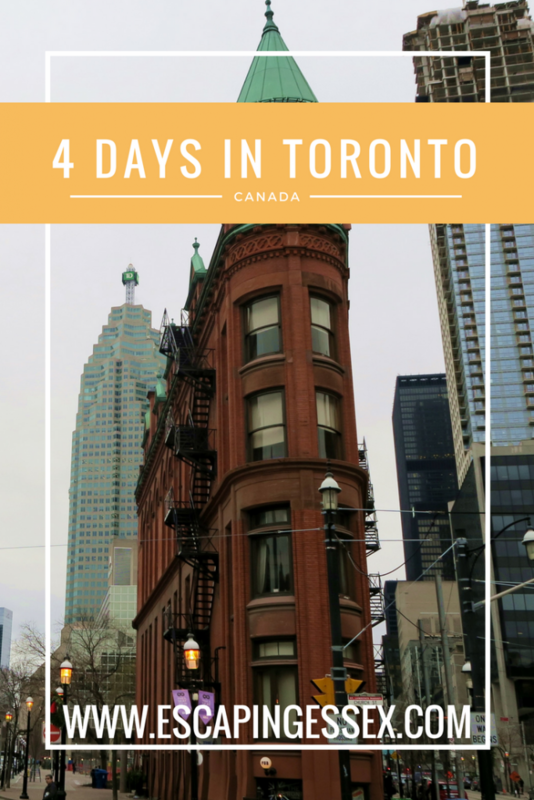 If you’re looking for a Winter break, here’s a little itinerary for visiting Toronto! If you read my review of the Renaissance Toronto Downtown Hotel, you will know that the breakfasts in this hotel are pretty damn epic and should be tried by everyone. RELATED: That hotel sounds amazing right? 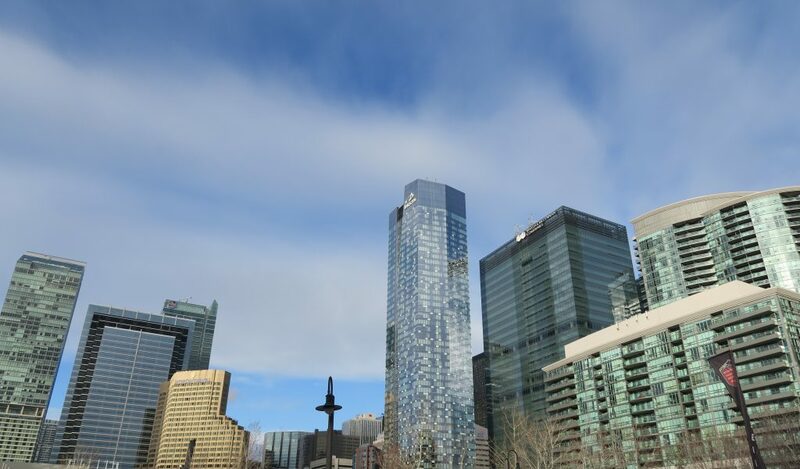 Read my review of the Renaissance Toronto Downtown Hotel here! 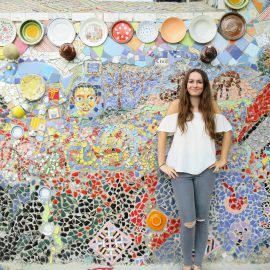 I talways recommend a free walking tour when you first arrive in a city as they are a great way to orientate yourself and learn about the city you are visiting. 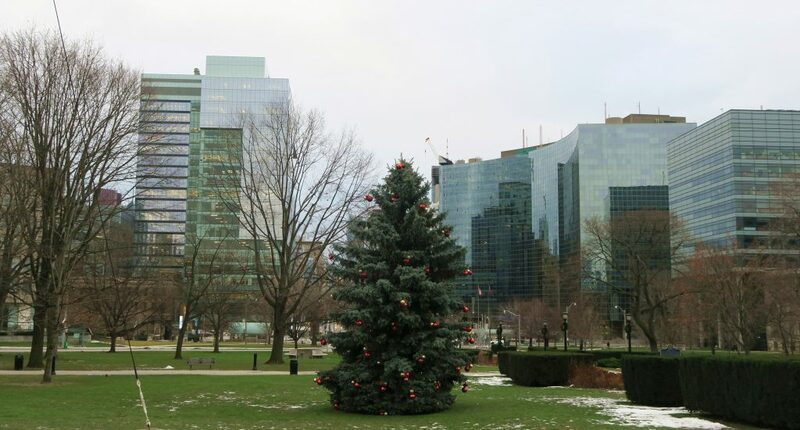 However, we visited Toronto in late December and temperatures were plummeting below freezing. For that reason, many of the walking tour companies were running a limited service (if at all), so we were left searching for an alternative. We found Gerardo on Tours By Locals who organised a drive-through tour of the city, gave us in depth knowledge on a city he is clearly passionate about and generally set-us up well for our trip. We covered so much in our time with Gerardo that it would be impossible to list it all here but highlights include the Discovery District (home to the beautiful University of Toronto buildings), Casa Lomas (from the outside, we later re-visited to go inside), the Distillery District and a secret little spot for a great skyline view of Toronto without having to visit Toronto Island. 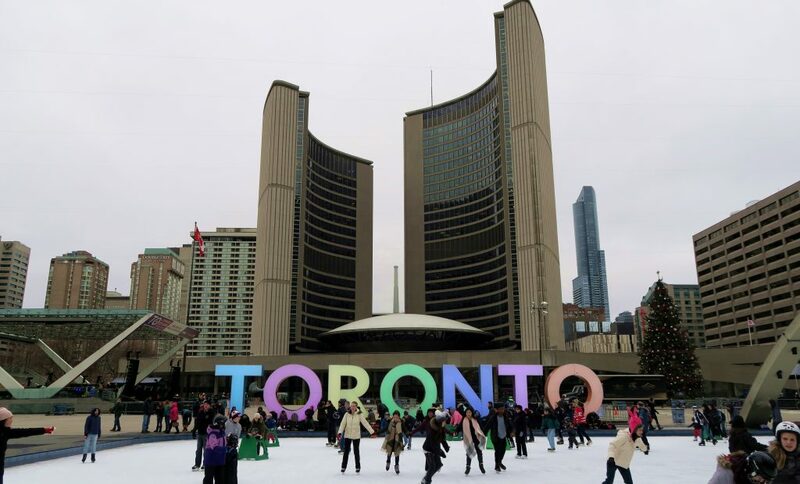 As we were visiting in December, the ice rink was open and people were visiting in masses to skate in-front of the famous “Toronto” sign. Given the fact that I can barely walk in a straight line without falling over (this goes for my sister too), we decided not to give skating a go – there wasn’t even a rail around the edge to hold on to! But people watching was just as fun! 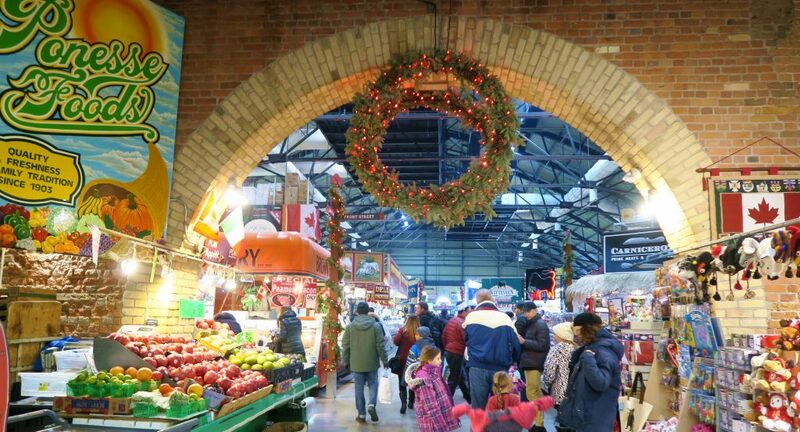 St Lawrence Market is Toronto’s answer to Borough Market and was extra fun to explore with all of it’s Christmas decor! The perfect place to stroll around and escape the bitter Winter wind! Much of the market is aimed at locals with fresh produce for cooking, but we did find some great little “cafe” type stalls for drinks and cake! 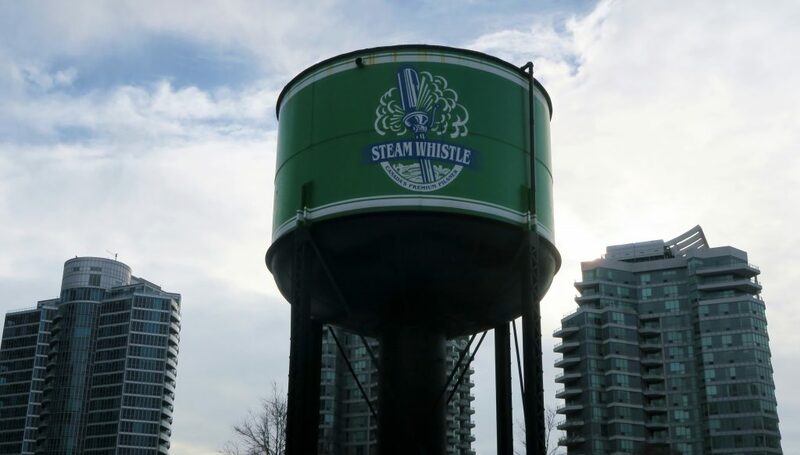 We were briefly introduced to the distillery district on our earlier tour with Gerardo but decided to return later on in the day to explore properly. The one thing I wish we had done is visit the district at night when it’s buzzing with people! If you are visiting during a cold day, make sure you check out the chocolate shop and get one of their hot chocolates! 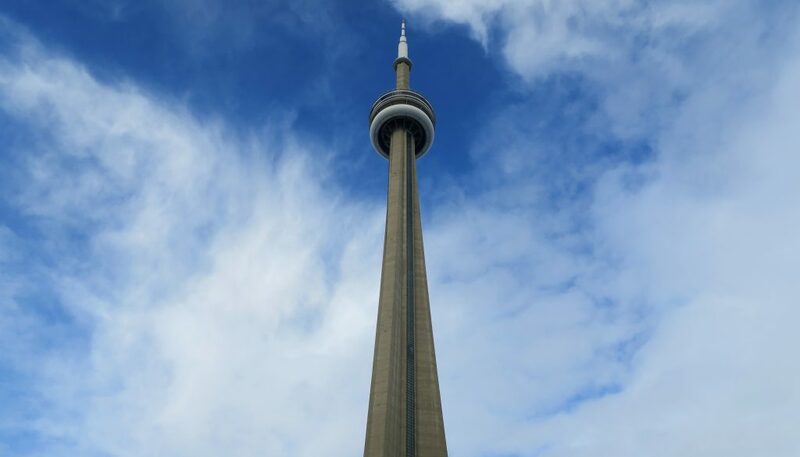 The CN Tower is arguably the most recognised building in the city and for good reason! One of the first things we booked (after the flights and hotel of course) was a chance to have dinner in the revolving restaurant. The entire experience was great (other than the rude waiting staff) and I will be writing a full post about the restaurant in due course! Stay tuned! 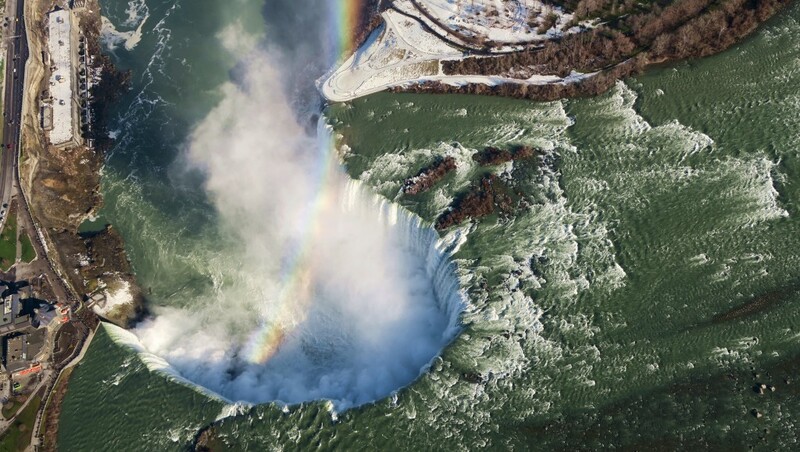 The opportunity to experience Niagara Falls was essentially the reason that we chose to visit Toronto for our annual family Christmas trip, so it’s safe to say that I was excited for this day! 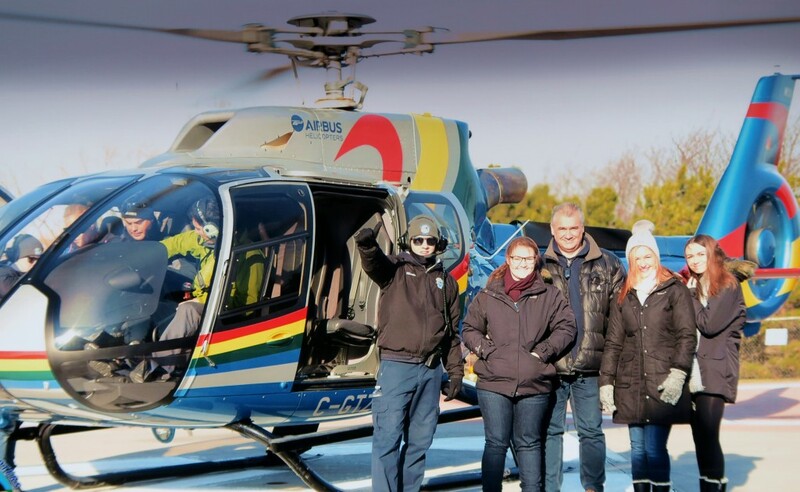 As we were visiting in December, the boat trip through the falls wasn’t running but we did manage to take a helicopter ride over the falls as well as complete the “journey behind the falls”! On the way back from the falls, we also visited Niagara-On-The-Lake which is the most gorgeous little town and tried the famous Canadian ice wine! I won’t ramble about this day too much as I have a whole blog post dedicated to this day which you can read here! If this isn’t the first time you’ve read my blog, you’ll know that I absolutely love castles! 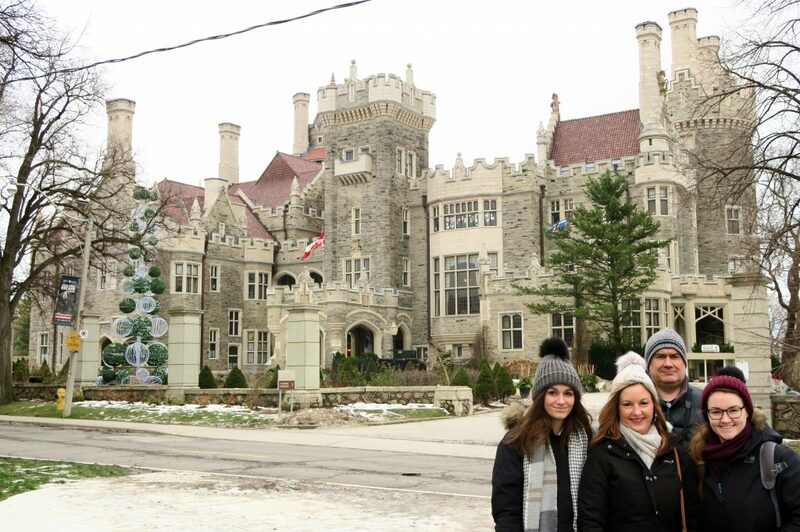 Casa Loma was built in 1911 as the home for Sir Henry Pellett – while it’s not strictly a castle (Wikepedia describes it as a “Gothic revival style house and gardens), it’s pretty damn close (albeit much newer than the Castles you see in Europe) and definitely worth a visit! Casa Lomas put on loads of Christmas activities (mainly aimed at kids) including having reindeer on the grounds! 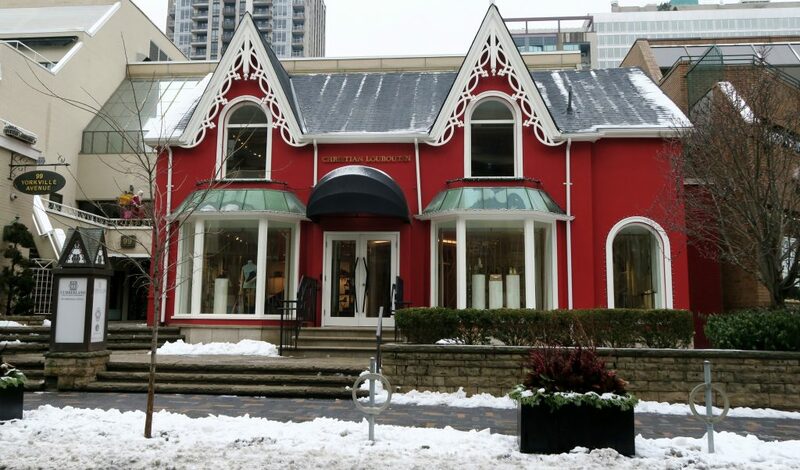 This area of Toronto is the “high end shopping” district – think Fifth Avenue and Regents Street. As we visited shortly after Christmas, the “Boxing Week” (week?! We only have a day in the UK!) sales were in full swing. Some of the shops are really gorgeous – my favourite being the bright red Christian Louboutin design! My only purchase was a Kate Spade black backpack which was heavily discounted! I’ve used it practically every day since, so I’m very happy with my bargain purchase! Boxing Day sales scare me, in the UK they are filled with hundreds of people pushing and shoving to get their grubby hands on the best deal. This was not the case in Toronto and it was a really pleasant experience! So we decided to carry on our shopping escapades with a trip to the famous Eaton Centre which is more high-street orientated than Bloor / Yorkville. …. Or any of the park areas really! 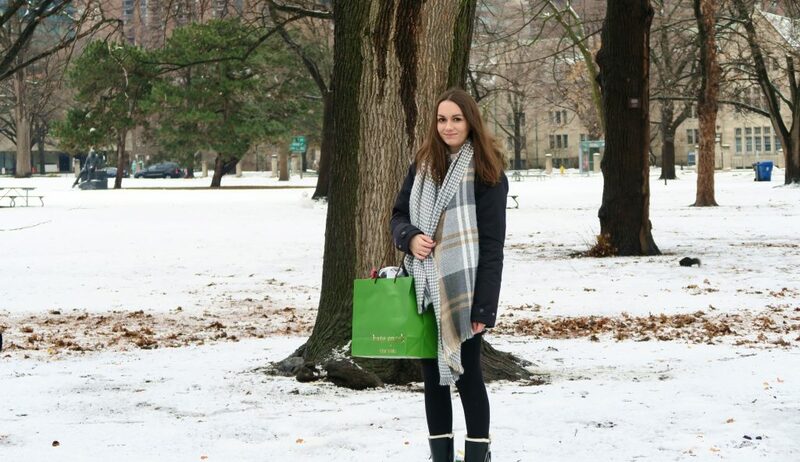 We loved strolling through Queen’s Park while the snow was settling, it was really beautiful and felt like a proper Winter Wonderland! Did you know that Toronto is home to a whole host of theatres? I didn’t! There were so many great ones to choose from, so making the decision will be the hardest part! As we had my “little” sister with us (20 years old with the mental age of an 8 year old), we were all dragged to watch the latest Disney on Ice show. It certainly wouldn’t be my first choice but it was fun having 6 year old girls stare and judge you for knowing all the words and singing along loudly without shame. On our hunt for something close-by to do on our day of departure, Steamhouse Brewery was recommended to us by the lovely people of of the internet and we had a great time! The motto of this brand is to “do one thing really really well”, so they only produce one type of beer but boy do they know what they’re doing! I’m not a huge fan of beer but it’s fun to see how these things work – our tour guide was super friendly and funny which added to the whole experience! Despite the fact it was December, on our last day in the city the sun was shining which made for a beautiful stroll along the harbour where we decided to have lunch. If you’ve got spare time in the city, I highly recommend spending some time in this area – there are even little beaches with deck chairs along the route (which we obviously did not use in December)! And like that, our first ever trip to Canada was over and we were headed back to the less snowy but equally cold UK! A short ferry ride from the mainland harbour are Toronto Islands. Gerardo (our tour guide on the first 2 days) spoke glowingly of the Islands in the summertime as they are a nature lover’s paradise – however we were visiting in the dead of winter and boats were not running frequently enough for us to enjoy the islands. This is where you will get the ultimate skyline shot of the city! Toronto is home to a whole host of museums. 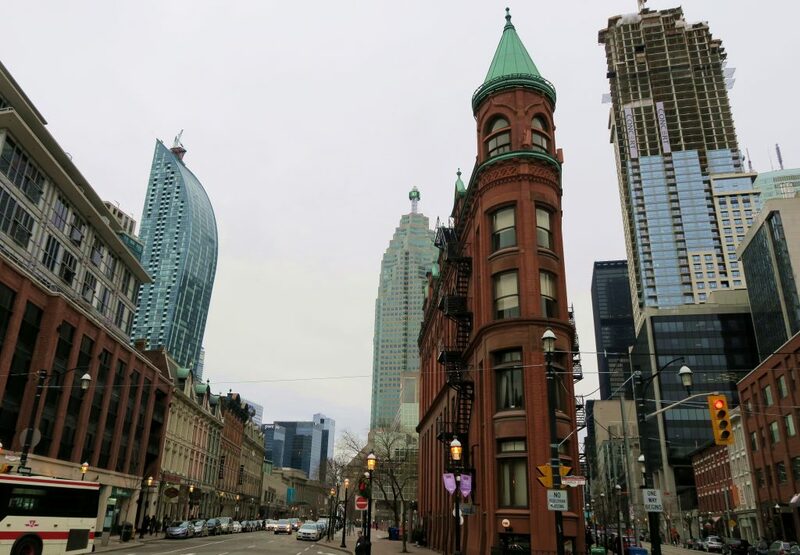 From some of the more “normal” establishments such as the Royal Ontario Museum and the Art Gallery of Ontario, you’ll also find some more quirky treats such as the Bata Shoe Museum & the Hockey Hall of Fame! Directly outside our hotel and the CN Tower was Ripley’s Aquarium which looks blimmin’ HUGE! If you’ve got some spare time to kill, this looks like a fab activity, especially with kids! But if you’ve read my Versatile Blogger Award post, you’ll know that I have a completely irrational fear of fish and all sea creatures, so this was a big no no for me! The Rogers Centre is home to the baseball team the Toronto Blue Jays. While our hotel had a view into the Rogers Centere (cool right?! ), unfortunately there weren’t any games on while we were visiting! So there you have it, a fab 4 days in Toronto! Have you ever been? Where would your perfect Winter break be? Wow there is quite a bit to do! I really want to go to Alberta in Canada but I think I need a few days in Toronto especially for that heli flip! Alberta is definitely on my list too! Canada is so huge and one trip to Toronto means I've barely scratched the surface of what it has to offer! Thanks a lot for sharing your experience in Toronto! I went there 15 years ago as a student and I only remember going on the top of the CN Tower! It looks like I missed some great activities! 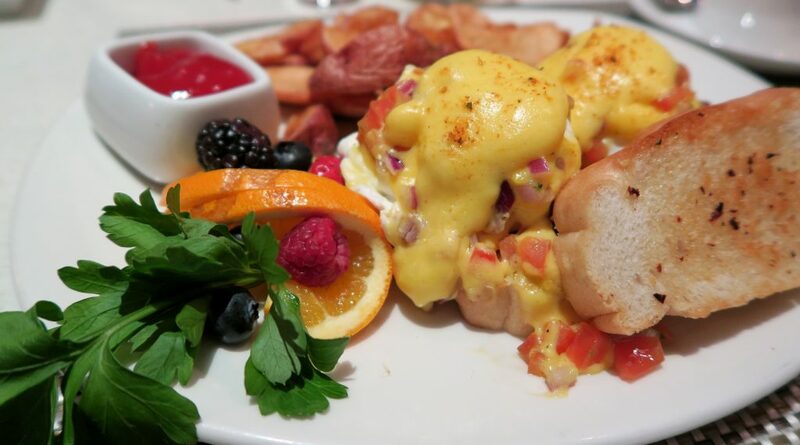 You had me at that eggs benedict! But the helicopter ride sounds AMAZING! I’m addicted to helicopter tours! They’re one of the best ways to see a city! We might be in Toronto in October, so your post came right on time! It was my first time in a helicopter – definitely the best place to have your first trip! !